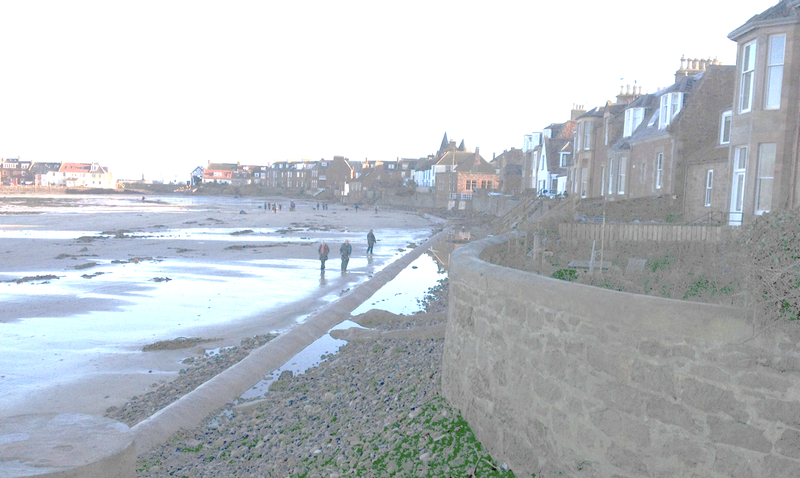 It’s the Sabbath and in bright sunshine beside an unbelievably calm sea (given what transpired on Friday night over into Saturday) I’m assessing the damage to North Berwick’s infrastructure from 24 hours of fury that did more damage than the storm of March 31st 2010. Disbelievers in any Wrath of God who witnessed it might well have had their scepticism shaken, if not stirred. It was, as then, a Hell’s Kitchen combination of unfortunate circumstances that drove major waves ashore on the crest of an unusually high water level. Spring tides were forecast for Saturday 16th—a 5.9m peak at 3:30am and a similar peak at 3:45pm. This was well known to all involved at the harbour, along with the forecast of SE winds out in the Dogger area of the North Sea, building large waves out of the South East. These are always a threat on top of big tides but the wind was forecast to back to the West late on Thursday, which was expected to calm waves down. Three yachties were distrustful of this reassurance and pulled their dinghies out of the Esplanade dinghy park late on Friday. Long-time civic figure in NB, Norman Hall, shared their misgivings. 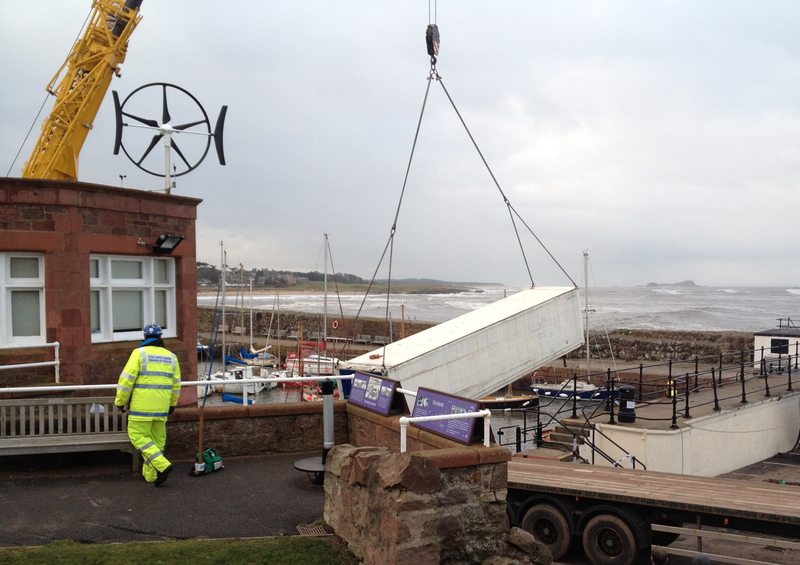 He contacted ELC’s emergency planning (01620 827779; emergencyplanning@eastlothian.gov.uk) to request sandbags and precautionary stationing of JCBs and lorries. ELC checked with SEPA, whose job it is to predict and prevent flooding. They reassured ELC that their model of the event showed Fife and further North bearing the brunt of it and East Lothian need not worry. Three things combined to make a bad situation worse. Firstly, the winds in the North Sea produced bigger waves than expected; secondly, the centre of the low causing the storm parked itself right over NB, dropping the barometer by 50mbars and adding another half-metre to the tide height; thirdly, the wind did back to the West but blew gently, which was not strong enough to dissipate the waves, in fact it steepened them. Although fishermen, lifeboat and yachtsmen all spent a sleepless night with one eye and one ear out for the weather, no-one could have done much to prevent the major damage, even had everyone been on full alert. Around 3am the worst of the storm came ashore at the peak of the tide. 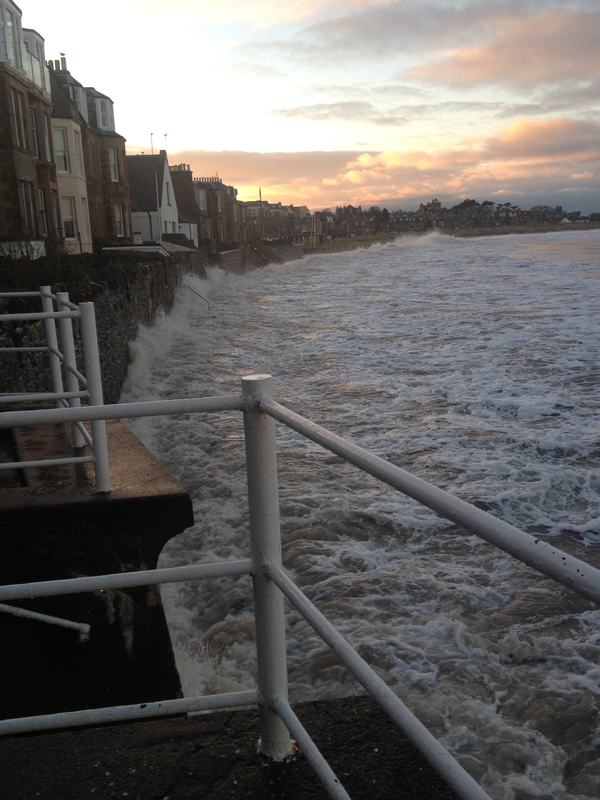 For more than an hour beforehand, the sea defences of the Esplanade wall had been overtopped and the Esplanade itself filling with seawater to a depth over 2m. All of the 50+ dinghies tied down on the Esplanade were flooded and buffeted by large waves sweeping over the top of the sea wall without much hindrance. In the previous storm, most had broken loose and piled on top of each other in the west corner where a barred gate acted as a drain. This time they held firm, although some were damaged at their tie-downs by the force of the waves. Those waves broke loose a 40ft container that had arrived only that day and was tied down adjacent to the Lobstery Hatchery at the east end. One of the fishermen intended using it as a keep tank storage of his catch. Once free, because its doors let in water only slowly, the container floated. 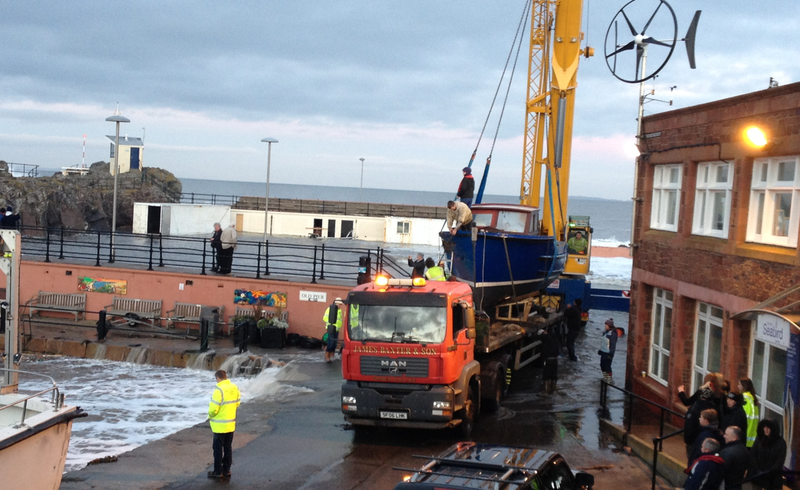 Pushed by waves, it acted as a battering ram against the moored dinghies until it was swept along to the harbour quay underneath the Seabird Centre offices. Here it fetched up against the yacht Borecay, standing on its cradle on the quayside. The metre-deep water pushed Borecay off its cradle and against the harbour railings so hard that they gave way and everything piled into the harbour on top of the boats moored in the SE corner. Meanwhile, the Girl Pat, sitting at the west end had been floated off its blocks and was driven against the old pool cubicle block so high and so hard that it bent the railings along the top, which stove in much of her starboard side. Local people have taken this particularly hard: this was Chris Marr’s boat. Before dawn, as the tide dropped and the waves relented, the harbour was a hive of activity as ELYC members rescued as many dinghies as possible from the esplanade, fishermen were winching the harbour booms into place, Harbour Trust Association were trying to assess the damage and police, fire and ELC Transportation all showed up in strength to sort things out before the next, equally-high tide made it worse. Although no significant damage occurred on either of the main beaches, huge amounts of sand were eroded and marram grass areas all along the East Beach were halved in extent as the sea clawed 4-6m towards the road. Back at the Seabird Centre, the sea had entered by an emergency exit and partly flooded the exhibit area and cinema. But the main loss there appears to have been water damage to the shop store which is located under the cafe deck. Nonetheless, they were open for business again on Sunday. Before the afternoon tide could return, all of the dinghies, most of the debris and all of the damaged boats had been recovered and removed. 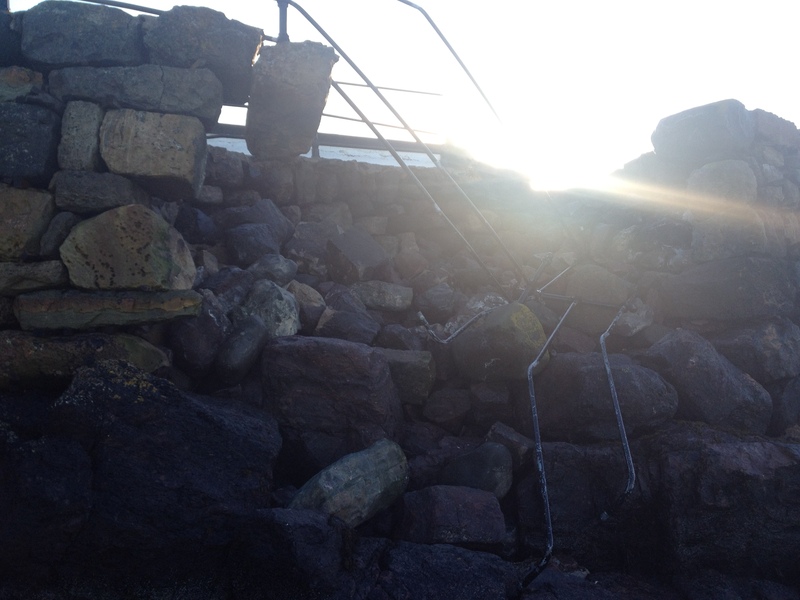 But nothing could be done to prevent more damage to the oldest part of the harbour wall at its NE corner. Here the rough stones had been held in place for half a millennium by wooden chocks through all kinds of weather. This time, it gave and a 5m section of the outer wall collapsed into the gully below. 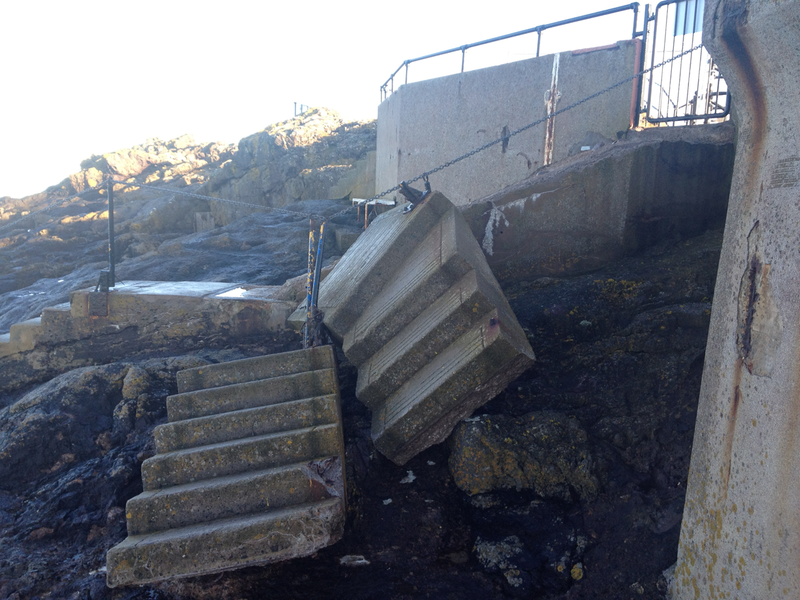 This exposed the rubble core which the afternoon tide washed out. By evening, only the pump hut on the N pier was holding up the inner wall and stopping the waves from gushing straight into the harbour. The waves were observed to be an unusual format. The sea would be rough with normal waves for 2-4 minutes. Then a set of a half-dozen monster waves, most estimated to be over 4m would appear and, as quickly, disappear. More than anything, those super sets caused the bulk of the damage, coming as they did on top of a record sea levels around 6.4m above chart datum. The hardest to solve but most urgent issue is how to deal with the harbour wall. It will need to be restored so that it does not look out of place, which will take both time and craft. Meantime, some temporary patch must be found because leaving it in its vulnerable, torn open state only invites another storm to break through to the harbour and wreak even more damage than we’ve had already. Adding the loss to boat owners to the major infrastructure problems, this is already a more costly storm than 2010. 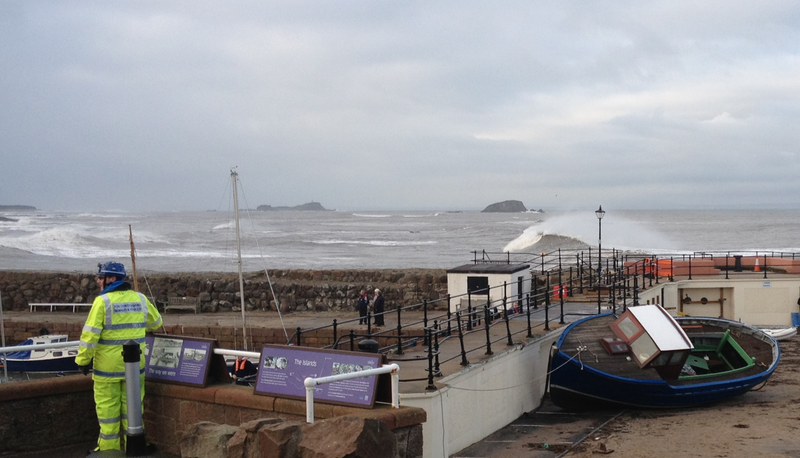 While North Berwick usually likes publicity, the last three weeks have brought it too much of the kind it prefers not to have.It makes locals wonder what they have done to provoke something verging on the Wrath of God. Following our Fire Station burning down, we lost an iconic figure in Chris Marr within a week and, within a second week. have had the focus of the town wrecked in a night. Not the sort of run-up anyone wants to have towards Christmas. This entry was posted in Community, Environment and tagged storm damage; NB harbour; spring tide flooding. Bookmark the permalink.